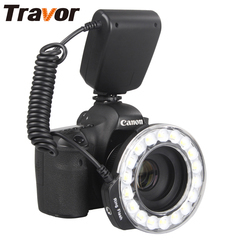 Home › Flashes & Accessories › Macro & Ring Lights › Travor 18pcs Macro ..
6. Including 4 Diffusers (Clear, Frosted, Blue, & Yellow ) and 8 Adapter Rings (49-77mm), will fit 49, 52, 55, 58, 62, 67, 72, 77mm Lenses. 7. For Canon 750D, 760D, T6i, T6s, 7D Mark 2, T2i, T3i, T4i, T5i, 550D, 600D, 650D, 700D; Nikon D500, D5500, D750, D7100, D7200, D800, D800E, D810; Sony A6500, A6300, A7 II, A7R II, A6000, A7, A7R.